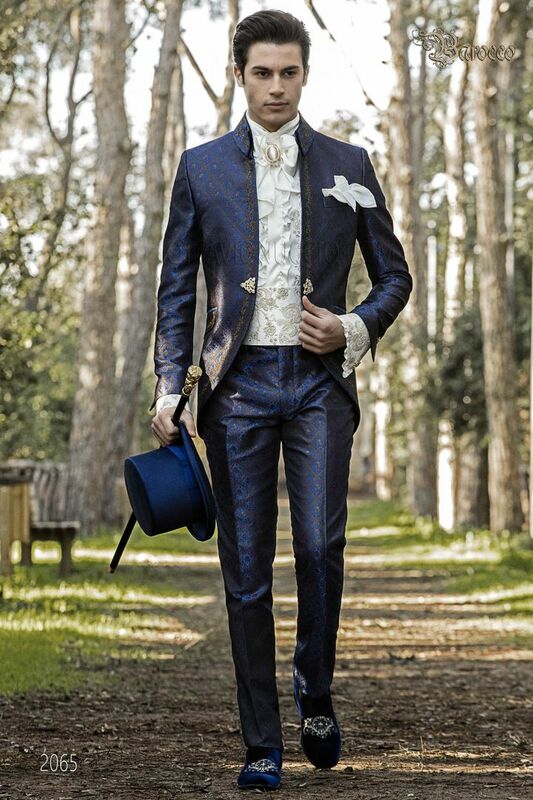 Royal blue brocade baroque luxury frock coat suit with golden-black embroidery on the front side and the back side. Napo... Royal blue brocade baroque luxury frock coat suit with golden-black embroidery on the front side and the back side. Napoleon collar with patterned buttons, 1 single vent at the back with Redingote-style seams, flap pockets, rhinestone frog closure and embroidered cuffs on the sleeves. Cummerbund made from ivory satin with gold-tone embroidery. Handmade.